Riva, the iconic brand of the Ferretti Group, launches its new flagship, 122' Mythos. Riva 122' Mythos, the largest aluminium planing yacht ever produced by the historic shipyard, perfectly transfers the elegance, flair and clean lines featured by all Riva models to a new line built entirely in light aluminium alloy. Hull number C.2218, the second hull in the new generation 60 M sailing yacht series sold by Perini Navi, has arrived in Viareggio. Exciting new model introduced at Cannes Yacht Show. 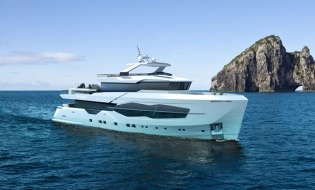 NISI Yachts reports a new model to be unveiled today at the prestigious opening day of the 35th annual Festival de la Plaisance in Cannes, France. The NACIRA 67 is a unique concept directly inspired from the latest evolutions in naval architecture and luxury design from the ocean-racing scene. The new Oyster 725 is a stunning development of the well-proven Oyster 72, and will make her première at the 2012 PSP Southampton Boat Show. The first unit of the innovative displacement line WallyAce, the 26m Kanga, was successfully launched in Marina di Ravenna, Italy.